Bizarre dreams make room for crisp awake state. All last night I was having dreams. Before I could get the chance to totally relax and dip into the quiet abyss of complete and total subconscious rest, I was resuscitated back into a completely torturous visual fest. My mind was exhausted this morning as I struggled to rustle myself out of bed. I do have a penchant for the time consuming process of slumber chamber extraction. I consider it a sport. It should be televised if I was put in charge. It is something about being woken up by oneself due to lack of comfort either physically or mentally that wears down a person’s constitution. The dreams seem to paint a landscape of peaks and valleys. A possible hope of dreamlike escape only to be hampered by other parts of your noggin. I was at a horribly dull convention center or possibly an airport. Beige. Massive expanses of patterned carpet with neutral colors that dutifully welcome the steadily trudging traffic from outdoors. Mud and muck simply hidden from sight with complimentary shades and hues. The walls, a horrible pattern of mass produced beige with some hints of mustard could hint at the concept of a village of Tuscany. This was completely lost on me, even though that was the intent. The large expansive hall had a succession of furniture spaced evenly as far as the eye could see. These clusters of furniture and planters snaked down along the hall dotting the beige with pock marks of that horridly overused hotel brown color. Can’t we try something different? The halls had people wedged within the available open spaces all blankly staring or looking around oblivious to their limbo state. Continued my way down the hallway. I watched one of the people in the hallway projectile vomit across the floor, spewing a colorful cluster of what appeared to be foam and colored water out onto the carpet. The carpet’s meticulous attention to pattern and color doing it’s best to try and camouflage the rather unpleasant scene at my feet. I stopped. The man continued to contort his face regurgitating countless amounts of foam and bile from his mouth as he was “trying to make a deal” on the phone. He continued to press a cloth on his face while listening to someone on a phone. His statements were confident, yet the expression on his face would easily betray his remarks. I looked down again at the floor. There was a tidal nature to the unsightly fluid below. The perimeter of undigested nerf material pushed beyond my shoes and out to the other end of the hallway. Other people sitting on the floor paid no attention to the soggy carpet they were sitting in, but by now they started smoking and drinking. The hall became hazy. There was a smell. Like baby powder. I looked down at my shoes again. I noticed I had a plate in my hands. Also I noticed that there was another set of shoes nearby mine. They were clean and shiny. The person attached to these shoes wore a crisp set of olive green slacks. I lifted my view up to eye level and was caught by a stoic stare of a person in high position in the military. Really square jawed and stern features. I am guessing he was a general. I paused and took note that he was either not aware of the vomit or had no interest in it. By this time I was concerned. He asked me if I had a been to the council. I hadn’t. I didn’t know what it was, but I hadn’t and I am guessing I should have by now. The foam was floating. There was an inch of fluid rushing along the side of my shoes. He was displeased, not about my lack of interest in the activities of the council but that the smoking had increased from events in the previous years. The hall had become a street. There was a car in it. The man vomiting had long legs and two pronounced grooves were set in his thigh and shin. The grooves I assumed were from cars driving over them. He didn’t seem to mind or care. The person on the other line seemed to be the only interest he had. He laughed and chortled on the phone oblivious to the steel belted radials crushing a length of his foam and vomit drenched pants legs. The general swung at me. I had a plate. I walked quickly around to the other side of the car avoiding him. His face was normal but I do believe his body was just the clothing. He kind of flopped around much like a rag doll that was suspended in the middle to an upright position. The vomit pulsed again across the hood of the crown victoria parked near the business man. By this point I felt my best option was to get into the car. It smelled like clean leather. The car was from the eighties but the interior displays were unreal. The space was blanketed in light. Some sort of mash up of an ancient Mayan calendar, a futuristic tron bike and a fireworks display. The cab driver was dead. A completely dried up carcass of bones dried skin. The caved in eyeballs veneered with a glowing representation of a human expression. Dashboard and steering wheel components grown into the rib cage of the poor soul turning it into some long dead organic component of it’s mechanical host. “Where to?” it inquired. The glowing interface glittered and changed into a surreal landscape of any desire you had. It appeared to read minds. The drivers face filled with static then skipped a little, some sort of bypass message came on. “No. You have to eat it.” The idea didn’t seem odd, it made a lot of sense. Sort of like I was wrong for not knowing what to do. “Well it does look good.” I thought to myself. The items were cute and shiny, both items were like well made Swiss pastries. Sugary colorful and realistic. I sniffed the cupcake and smelled it, the lips opened a little, I could hear a sigh. There was a breath from the cupcake. I started to lick the top lip and feel the texture of the soft lip. A kiss ensued, it was a soft kiss also with the flavor of apricot. The sweet flavor struck a chord with a deeper hunger pain. 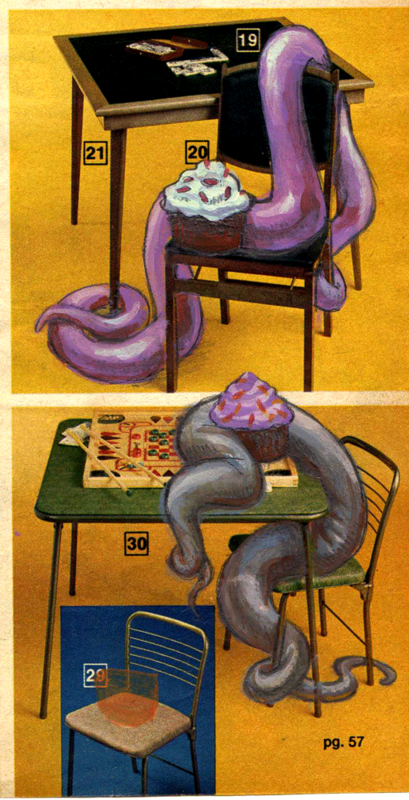 The cupcake began to take the lead. It progressed to slide it’s tongue into my mouth. The sugary ooze blended with my saliva breaking it down reducing the detail of skin and teeth. 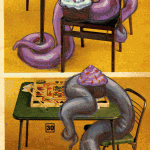 I mushed my lips further into the cupcake, parts of sponge cake touched the tip of my tongue. The passionate kissing started blending into eating. My teeth uncontrollably started sinking into the lower and upper lips. I was horrified and delighted at the same time. “Almost there” The dried carcass blurted. The cupcake was stuffed into my mouth. I took gluttonous bites letting cake and icing crumble down my shirt. The area outside of the car had changed, the outside was bright and sunny. I licked my fingers as the crab boat looked up at me with a smiling face. I look down at the crab and put my finger on the little crab claw. It had a pipe and a captain hat. I didn’t want to eat that one… yet.